The annual favourite in all dog lovers’ diaries, Crufts 2019 takes place 7th-10th March at the NEC Birmingham. With its first event taking place in 1891 the event attracts thousands of visitors every year and showcases our favourite four-legged friends. 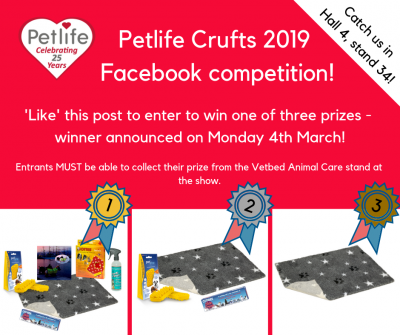 In the lead up to Crufts 2019 Petlife International are giving 3 Crufts visitors the chance to win 1 of 3 fantastic Petlife prizes through a competition on our Facebook page. To enter to win one of the three prizes visitors just need to ‘Like’ the competition post – the three winners will be drawn at random at 9am on Monday 4th March 2019. To enter to win, simply ‘like’ the post here. 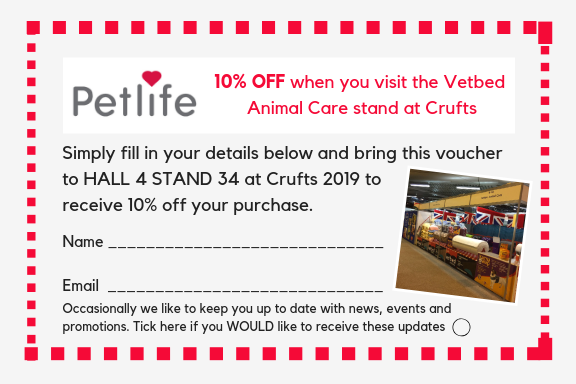 Don’t forget to complete this voucher for 10% off Petlife products on the Vetbed Animal Care stand in Hall 4 on stand 34. – Three winners will be drawn at random at 9am on Monday 4th March 2019. – By entering this Facebook competition in the public domain on social media, you agree to us publishing your name as a winner, IF you have been selected at random as one of the 3 winners.